World number one Rory McIlroy is three shots off the first-round lead at the Abu Dhabi HSBC Golf Championship after opening his year with a five-under 67. The Northern Irishman started with a birdie, and after a bogey on the 17th - his eighth hole - he knocked in five birdies in six holes to share fourth. America's Rickie Fowler is also on five under after a bogey on his final hole. Three-time champion Martin Kaymer of Germany leads on eight under, with Belgium's Thomas Pieters one shot back. Kaymer, who won the event in 2008, 2010 and 2011, missed a 20-foot eagle putt on the last but knocked in 10 birdies in his round of 64. England's Tyrrell Hatton had a bogey-free 66 to join South Africa's Branden Grace and French pair Gregory Bourdy and Alexander Levy on six under. McIlroy admitted to being spurred on by Fowler after reaching the turn two shots behind his playing partner. "I was just trying to keep up with this guy," said the 25-year-old. "He was kicking me on, for sure. I just wanted to try to stay as close to him as possible." 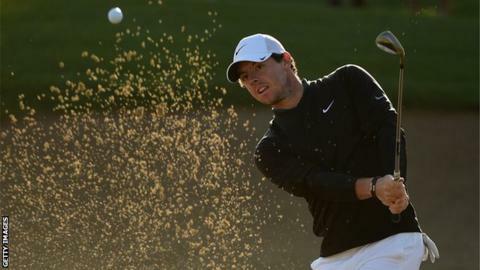 The turning point in McIlroy's round came on the third when he managed to hit his second shot from the lip of a bunker on to the green and hole out for the first of three successive birdies. "I had one foot in the bunker, one foot out and 95 yards to the pin," he said. "It was an awkward stance, something you don't practice. "I was hoping to make par. It was looking more like a bogey and I ended up making birdie which gave me momentum. "The result was good, 67 was pleasing. How I got there in the end wasn't quite as pleasing. There's a couple of things that I need to work on if I want to have a chance." Fowler, who finished in the top five in each of last year's four majors, was satisfied with his round, despite the dropped shot on the par-five ninth. "I was a little shaky," he said. "I haven't played in quite some time, so it's nice to get things off to a consistent start and throw some birdies in there." England's Tom Lewis hit the tournament's 10th hole-in-one on the par-three 200-yard seventh on his way to a three-under-par 69. Spain's Miguel Angel Jimenez later equalled the feat on the 177-yard par-three 15th, although bogeys at the next two holes saw him finish level par.